Eastern region of Afghanistans climatic condition is favorable for citrus growing; therefor the growers prefer to establish citrus orchards. Based on this fact the demand for citrus saplings is higher compare to others. Since the demand increased the nursery growers started to expand their citrus nurseries to supply the demanded saplings of citrus to the costumers. But in many cases they failed to achieve their objectives due to lack of knowledge regarding citrus growing. One of the important steps in the citrus nursery establishment is to have healthy seedlings in the right time for transplanting and then proper transplanting. So with the new and advance techniques you can get very good results compared to the conventional method. 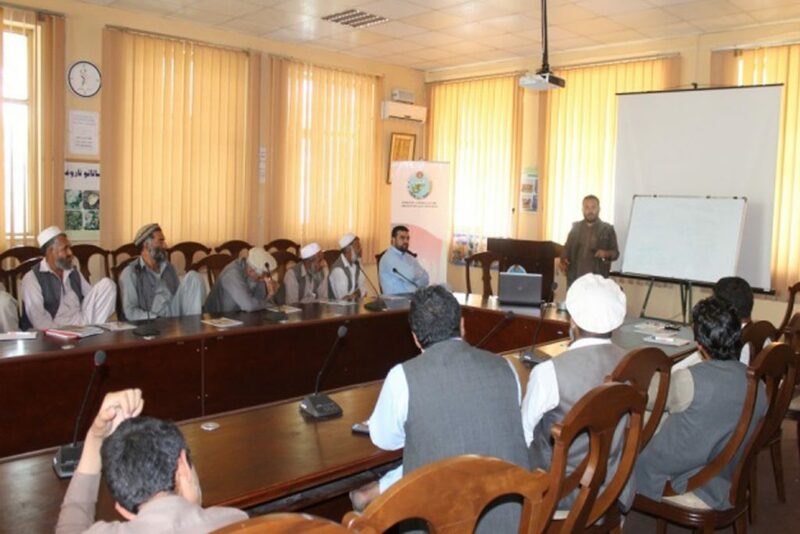 To improve the knowledge and skills of the Nangarhar nursery growers in this regards. Nangarhar NGA organized training with the financial support of Mercy Corps/SAGAL project and with the technical support of ANHDO/SO4 team. With such coordination we are avoiding duplication of activities for instance avoid providing the same training to the same group of people by different projects. Build the capacity of NNGA member equip them with modern agriculture practices in citrus seedling production. Design of the training: Presentation by trainers, group activities, practical work in the field (Demo plots) and question & answer sessions.